All the time in search of the meaning of life, Reef Tiger never stop exploring the Swiss watchmaking spirit. In the course of history, every new product of Reef Tiger are constantly showing classic spirit in a modern interpretation. Today, the new launch Seattle Walker watch using its elegant designed and Swiss-made automatic movement reproducing the classic legend. 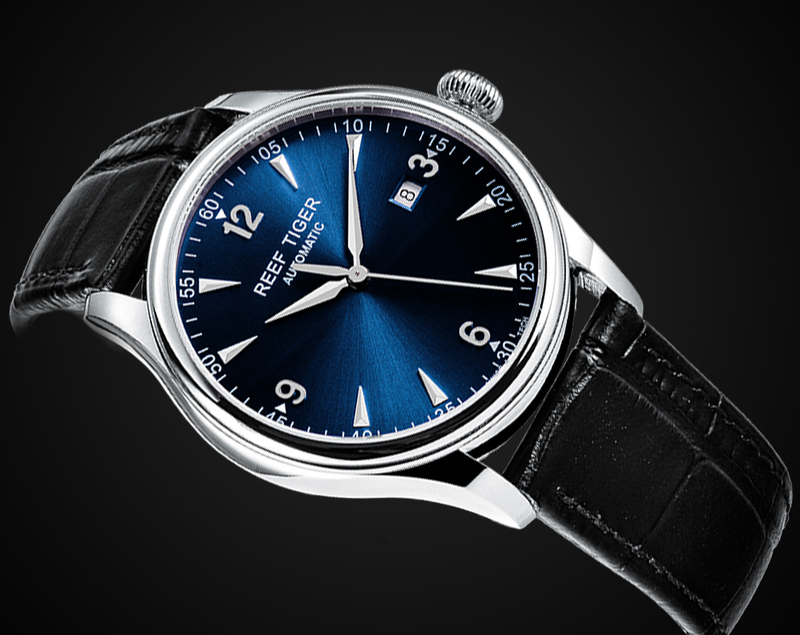 Its harmonious dial is unparalleled in simplicity, balance and elegance. Famous Pellaton winding system has been improved: some components are made of highly wear-resistant ceramic; increase to double barrel, power reserve up to 3 days. The 40.5mm Walker watch case appearance is simple and lofty, while the inner carrying a hundred years of watchmaking history, low-profile but unique. The Reef Tiger watch is simple, elegance and exquisite. The 40.5 mm stainless steel case matches with silver plated and pure black dial, as well as the platinum-plated scales, always exudes elegant taste. The sword-shape pointer symbolize the calm in the face of any difficulty. Oversize second hand and kinetic design, as well as the AR coating allows you to easily read the time. The Walker watch strap adopt with Italian strap, showing steady and wise style, creating a pure elegant extraordinary taste.